Picking up commission projects can be very lucrative for artists. There are fewer things are more rewarding than knowing someone wants to hire you for your skills and talents. However, working on commission can be very stressful if expectations aren’t established from the beginning. Meet in advance to talk about what the client wants or needs. Show them examples of your work so they understand your skill level and get ideas. Provide feedback on their idea and let them know if it is feasible. Before I get started, I let my clients know they will be allowed to make up to three edits to the piece before it’s finished. This sets the expectation from the beginning and minimizes the chance that the painting will be impossible to finish. When I work with clients, I provide a price list that explains all the details about pricing and requirements. I ask for a 50% down payment in advance, unless I know the person well. When I first started doing commissions I felt pushy by asking for a down payment but there’s nothing worse than spending hours working on a piece and having the client disappear when it comes time to pay. Make sure you are realistic about the length of time it will take for you to complete the artwork. When it doubt, give yourself a few extra days. It’s always best to under promise and over deliver, than vice versa. Once you’ve learned about the client’s idea, you’ve established a deadline, and they’ve paid their down payment, you’re ready to get started. If painting a piece, I always send the client a preliminary sketch to show them to composition and layout before I start painting. I’ve found my clients love to see photos of their piece while it’s in progress so I frequently take photos of my progress while I’m working on the piece and text or email them to them. This allows them to provide feedback and have input throughout the process. Once the artwork is complete, it’s important for you to deliver it promptly. I also like to mat the painting and package it in clear protective packaging so it looks professional and stays protected. I also include a nice thank you card and a couple business cards. 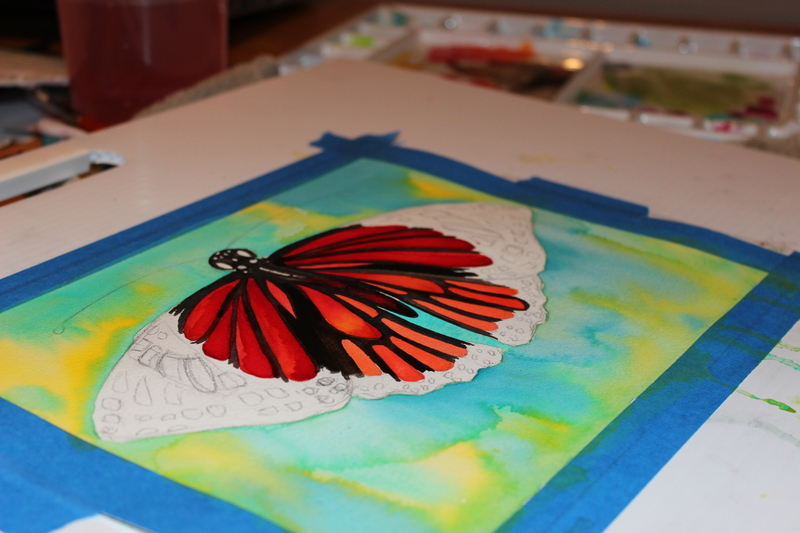 Hopefully these tips will set you up for success as you work on your own commission projects. Best wishes!